I’ve been here once before, last fall, when dear Janet was giving away a large print copy of FAT CAT AT LARGE. She’s at it again, and my tired old eyes are grateful for another large print book. This time it’s FAT CAT SPREADS OUT. You know, that cat, Quincy, turns up everywhere. He’s a sweetie and he loves for me to feed him. I had my neighbor, Professor Fear, take me to the fair to get some Raspberry Chiffon Bars from the booth those nice women set up. That would be Ms. Chase Oliver and Anna Larson, the ones who own the Bar None dessert bar shop. Who do you suppose we saw napping on a display case? A cat that looked exactly like Quincy! Chase hurried off when we told her that, but Anna boxed up some treats for us. They didn’t bring my favorites to the Bunyon County Fair, but these pumpkin flavored Harvest Bars look and smell delicious. I’ll bet Quincy would like them. Next time he gets out and comes to my house, I’ll give him some. It’s me, Janet, the author. I have one copy of the second book in the series, FAT CAT SPREADS OUT, in large print to give away. Please either leave your email below or message me with it. I’ll pick a winner at the end of Friday and mail it to you! I LOVE that cat! Large print would be super for my old eyes. Would love to read more about Quincy. And sometimes these old eyes welcome large print. Thanks for the giveaway. Quincy and my Malachi must be kissing cousins. Thanks for the giveaway. I'd be thrilled to have a large print version. My ancient eyes are starting to go blurry after reading for four or five hours in a row. I would love to read this book, especially in large print—thanks for the chance to win it! Love the Fat Cat series! Large print would be amazing, so much easier on the eyes. Thanks for the chance. This sounds like awesome story!! Thanks for the opportunity to possibly win the large print copy! My eyes would be grateful! I love that FAT CAT comes in large print. Some of us have a little trouble with aging eyes. Thanks for the giveaway opportunity. Fat Cat Quincy definitely has a sweet tooth, and who can blame him with all those delicious dessert bars! A cat,sweets and murder..count me in! Hope you all had a wonderful 4th of July and thank you for the Giveaway!! So glad to see series in large print. Now that I know this I'll get the first one. I now I can get a digital copy, but I still like reading the print version as often as I can, Thank you for the chance to win the second one in large print. I'm also recommending my library buy the series in large print for us "old. Eyes". j.marshall730@yahoo.com - Would love a copy of your second book! This sounds like a fun read. Janet Cantrell is a "new-to-me" author. Thank you for the introduction. Janet, I Love Fat Cat! and I would love to win a large print copy of the book! I collect autographed copies of my favorite (pretty much everyone I read) authors! thank you for this chance!!!!! THanks for a chance. cheetahthecat1986ATgmailDOTcom. Thank you for the chance to win. I read and enjoyed the first Fat Cat book not too long ago, but I haven't gotten a hold of the second one in order to read it yet. Can't wait to do so though. I love Quincy! I would enjoy having a large print. Having kitties on the outside, you never know what they will get into.My two, Furball and Bandit get into plenty. Thanks for this opportunity. Though I have only read one book, I love Fat Cat! I have read the first two Fat Cat Books! I can't wait to read this one, too! I hadn't heard of the Fat Cat books before. I have to get my cats in books because hubby is so allergenic to them. I always enjoy discovering new mystery authors. Would love to read a copy of your book. I like that this one is large print. Thanks for the chance. Large print is so much easier on my eyes. It was neat that you offered a large print book when you did this giveaway! Would love a copy in large print. I am always looking for new authors to read. This one sounds like a fun read. I'm so sorry that my computer crashed on Thursday and I don't have the latest list of entrants. They include the above plus private messages. I should get it back on Monday and my fingers are crossed that the data will all be recovered. If it can't I'll have to go through all my messages and reconstruct. Meanwhile, sit tight and I'll announce a winner as soon as I possibly can. Thanks SO MUCH for you interest and support! I got all the entries together and was able to use random.org to generate a winner. 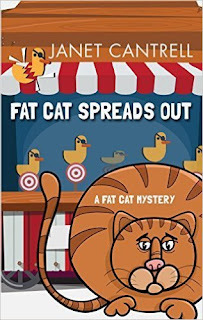 skkorman, you won the large print FAT CAT SPREADS OUT! Congrats! I'll contact you for your mailing address.